Is your daughter heading back to school soon? My daughter somehow starts 5th grade in a week. Wasn’t she just in preschool? It feels that way. She’s growing up though and no longer interested in cartoon backpacks so I wanted to put together some fantastic backpacks your girl will want for school. These backpacks are all in different styles and from a few of my favorite places to shop. This Blue and Pink backpack is such a cute pattern and it looks like a great size with pockets. You can get this one on Amazon and it is a great price. Although girls in 4th or 5th grade don’t want cartoons as much anymore on their clothes and backpacks. I know they do want Descendants stuff. This descendants backpack would be a hit with my daughter and her friends. They love that movie. I found this one at Kohl’s for under $20. 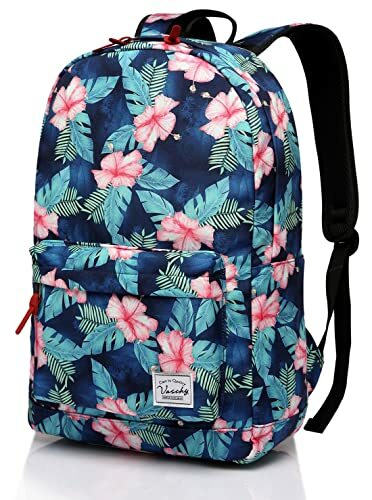 This floral backpack from Amazon was one of the favorite backpacks that we considered getting Isabella for school this year. It was my choice but she went with another one. I think this is so pretty and the reviews were great. Now I love this light Green polka dot backpack set. I love polka dots and this backpack comes in a lot of different colors. I’m sure your daughter would love. Plus I love that this one has a matching lunch nox. I also found some great back packs at Land’s End. I think this mini hearts backpack is so cute and my daughter gave it her approval. You can also get the backpack personalized which is a great feature. This canvas backpack with elephants is the one that my daughter chose for her new backpack for this year. It wouldn’t have been my choice but now that she’s 10 and in 5th grade, she definitely has her own style and when appropriate I like to let her embrace and have her style. This cute backpack has lots of great colors and print options. It also has really great reviews and is a really good quality backpack. Which is important because you want a bag that is going to last a long time preferably for the whole year. My daughter and I love the look of this Ombre Backpack. It’s one of our favorite backpacks for tween girls that we’ve found. For the start of middle school, it’s the top pick. This is such a quality backpack as well as being very cute and fun. So which of these backpacks for tween girls will want for school do you like the best?